President Trump’s postal reform task force recommended on Tuesday that the U.S. Postal Service eliminate the ability of employees to negotiate over compensation and develop a dual-tiered pricing model—one for essential services and another for deliveries deemed to have a profit motive. Led by the Treasury Department, the task force completed its report and delivered recommendations to the White House in August. But the administration decided to keep the report’s findings secret until after last month’s midterm elections, and to delay implementation until a new Congress is installed in January. Trump launched the task force, made up of officials at Treasury, the Office of Management and Budget and the Office of Personnel Management, through an executive order in April in an effort to tackle the Postal Service’s perennial financial problems. The task force concluded that the Postal Service's troubles stem from providing delivery for commercial entities at below-market rates, combined with lagging volumes of mail delivery and onerous labor costs, both in compensation and retiree health benefits. Officials said that the task force stopped short of calling for the privatization of the Postal Service because of its “financial state,” but suggested several ways to reduce the labor costs associated with nationwide mail delivery, chief among them ending the ability for postal workers to negotiate over pay. 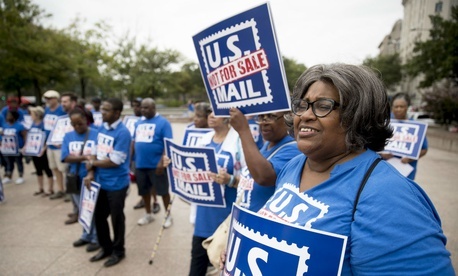 Such a proposal would require action from Congress, but the task force said “USPS should take immediate action where current statutory authority exists, including, but not limited to, aligning collective bargaining agreements with these principles” of law governing other federal sector unions. “USPS employees should not be afforded protections and rights not enjoyed by other federal employees,” the group wrote. One practice that the task force recommended keeping in place is the mandate that the agency pre-fund future retirees’ health care benefits—lump sum payments on which the Postal Service has defaulted for the last few years—despite calls from observers and some on Capitol Hill to end the practice. “The task force believes that this obligation, including the $43 billion in pre-funding payments that the USPS failed to pay into the Postal Service Retiree Health Benefits Fund and the unfunded actuarial liability for retiree health benefits, must be restructured with the payments re-amortized with a new actuarial calculation based on the population of employees at or near retirement age,” the report stated. The group proposed to increase revenues for the Postal Service by developing a new two-tiered pricing model, maintaining existing methodology for “essential services”—a term used to include, among other things, person-to-person mail and packages, bills, government documents—and a more expensive price for commercial deliveries, which senior administration officials said would include e-commerce packages, as well as marketing and advertising mail.